The ship is getting old but she's still got life in her yet. The 2019 Ford Fusion has arrived on our screens ahead of its live debut next week at the New York Auto Show. This is not a redesign of the mid-size sedan, but rather another refresh big on safety enhancements and light on styling updates. The big news is the addition of its now standard Ford Co-Pilot360, an advanced suite of technologies the automaker is launching for the first time with the updated Fusion. Expect future Ford vehicles to feature it as well. The system includes automatic emergency braking, lane-keeping assist, blind-spot and rear-cross-traffic warning systems, automatic high beams and even automatic wipers. According to the automaker, this is the only package that offers all of those technologies as standard on any new vehicle. Whether buyers opt for the base S or the top trim Sport, Co-Pilot360 is there. And speaking of trims, the 2019 Fusion offers up simplified trim levels and options. A couple examples include the SE now coming standard with the 1.5-liter turbocharged four-cylinder and other goodies like an 8-inch SYNC 3 touchscreen, dual-zone automatic climate control, and WiFi. The SEL, meanwhile, replaces the SE Luxury Package and offers plenty of creature comforts. The Platinum trim, previously the top trim, has been dropped. For those who care about being green, the Fusion Energi plug-in hybrid has an EPA estimated, electric-only range of 25 miles, representing a 20-percent improvement over the current car. 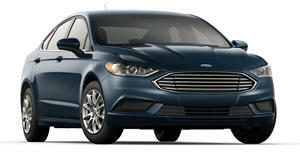 Ford claims there are 2,000 possible variations of the current Fusion, while the 2019 Fusion reduces that figure to just 36. Expect to see the 2019 Ford Fusion arrive in dealerships across the U.S. this summer.